Victoria (Vicki) Derhousoff of The Pas, Manitoba and formerly of Kamsack,Saskatchewan passed away at the age of 89 years on Saturday, April 21, 2018 at St Paul's Personal Care Home in The Pas,Manitoba. A funeral service was held on Friday, April 27, 2018 from the chapel of Andrychuk Funeral Home. Interment followed at the Riverview Cemetery. Victoria Koroluk was born in Wroxton to John and Martha (nee Matechuk) Koroluk on February 1, 1929. She completed her grade 8 and then went to work in Kamsack. She eventually met and married Peter Derhousoff on July 30, 1949. He was a grain buyer and that job took them to Kelvington and eventually to Endeavor, SK. This was where they raised their family, Dan, Terry, Andy, Sandy and Sharon. The family has grown to include 13 grandchildren; 18 great grandchildren and 1 great great grandchild. Changes in jobs brought them back to Kamsack then to the The Pas. Mom enjoyed curling (both watching and playing), card games, bingo and baking. In later years when they became snowbirds and traveled south, she was known as "the soup lady". Mom's greatest accomplishments were her family. As her kids grew she helped out in their various activities including cadets and 4-H. Mom also enjoyed spending time socializing with friends. There was always fruit on the table and baking brought out with a cup of coffee when someone came to visit. Mom leaves to mourn her passing, her daughter-in-law Dawn(Vern) Libbrecht; son Andy (Leslie) and daughter Sharon (Joe Nabess); as well as her grandchildren, great grandchildren and great great Grandchild. Her sisters Ruth, Lena and Verna, and many nieces, nephews and extended family and friends. She was predeceased by her husband Peter; her sons Dan, Terry and Sandy; her parents John & Matha Koroluk; her in-laws Pete & Anne Derhousoff; her brothers Mike and Jimmy Koroluk; and her sisters Mary Chambers, Anne Green and Pauline Reviczky. The family would like to thank all those who came to celebrate Mom's life. 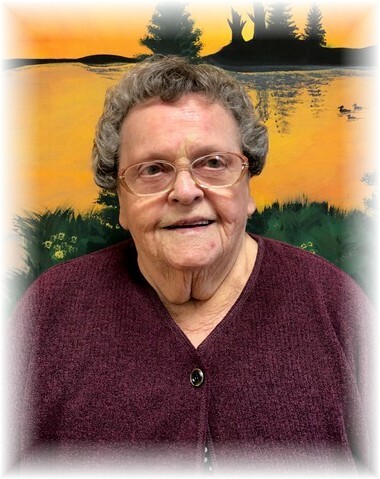 We would also like to thank those who provided Mom's care in Pineview (especially Barb & Yvonne), as well as the staff at The Pas St. Paul's Personal Care Home - where she resided for only 3 short months, but where she felt as if she was at home. Also special thanks to Janet Fulmore & Anna Troung who helped Dawn with Mom's care when she lived in The Pas.